A film about artists and by artists for the artist in all of us, Wash Westmoreland's Colette adapts and streamlines a fascinating true story through the eyes of someone most affected by the pain, superficiality and adjustment in a very difficult world, where egotism and identity politics are central to tempestuous and temperamental battles of heart and wit. What recommends the production most of all are its visual splendour, which intriguingly illustrates the twisted darkness and light relief of late nineteenth and early twentieth century France, its rich verbosity, and a committed ensemble featuring Keira Knightley, Dominic West, Fiona Shaw and, all too briefly, Denise Gough. But when all is said and done, a sense of unease persists beneath the slick surface of a biography that can't resist the temptation to take on a little more than it can chew. In the film, the historical figure of Colette, also known as Sidonie-Gabrielle Colette, is made for Knightley – a uniquely independent woman flying the flag in a sea of masculinity. She's a "country girl without a penny to her name" who falls in love with and marries a Parisian "literary entrepreneur" known as "Willy", played by West. Relocation from her rural idyll to big city life soon follows, as does the realisation that high fidelity on her husband's part is all smoke and mirrors. (Westmoreland is especially fond of the latter, with glossy, glassy reflections popping up multiple times to help dramatize the central characters' states of mind.) Knowing now that her Willy is more loose than she thought, Colette settles for being half of a power couple, in which she becomes the work to Willy's presentation of (and later, procrastination around) "his" latest fictional character – Claudine. Claudine is the soul of the film and of Colette's life, her own youthful experiences placed on the page and into the hearts of many keen readers, especially females. 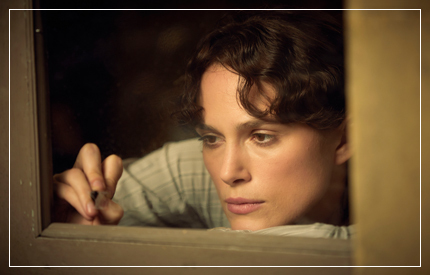 As ghost writer, Colette does not share the public credit for Claudine's success – that's all Willy's – but her intelligence and persistence brings out further desire for freedom and liberation in a once bashful beauty. Part thrill ride, part endurance test, the character demands bravery from Knightley and she is up to the task, experience from the actress's own real-life struggle with mental health clearly finding its way into a gutsy portrayal. As long as Colette stays focused on Colette, Willy, their family, their social circles and how Claudine both keeps them together and drives them apart, it's on strong ground. It is when the hidden brain is unleashed into the public eye, with Colette becoming a stage star and embarking on a serious affair with Denise Gough's Missy, that the film stumbles. The titular freedom fighter, after courageously battling for recognition, becomes a genuine revolutionary, opening a narrative door which needs more attention than Westmoreland can give it. Hence the final act seems more like an abrupt afterthought where we are more curious observers than the active participants we ought to be. Fortunately, Colette, if only narrowly, avoids the danger of reducing itself to a simplistic equality statement, and sends its central figure out with the bang she's earned. The once concealed, emotional empire within the star wars over a fictional character strikes back and shows, with due respect to Margaret Thatcher and Mr. Whitelaw, that perhaps not everyone should have a Willy. Though maybe the greatest attraction (or concern, take your pick) of the film is just how closely aligned it is to our culture. Confusion over Brexit, an empty Stormont, and frequent uncertainty over finding the right sort of voice and direction as both collectives and individuals... it looks like we could all do with a Colette. The NI Premiere of Colette opened this year's Foyle Film Festival, which runs in Derry-Londonderry until Sunday November 25. For more information on the festival, visit foylefilmfestival.org.